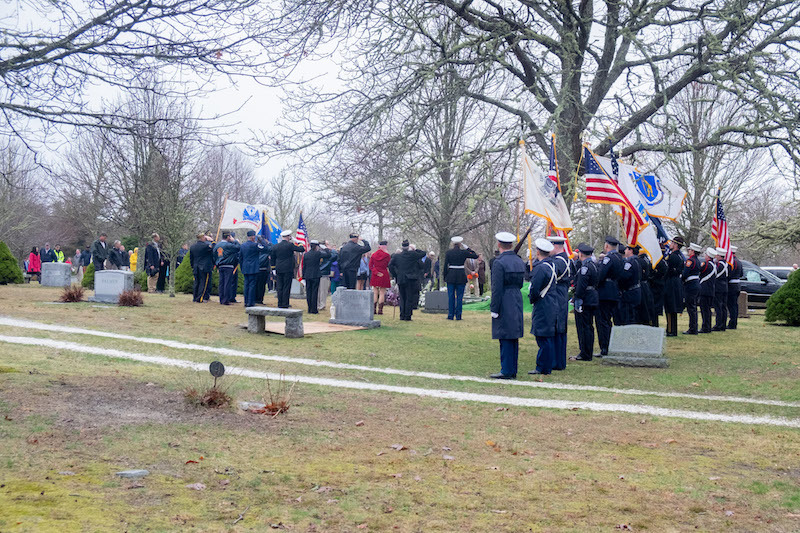 Mr. Morgan was buried in New Westside Cemetery in Edgartown on Monday, Patriot's Day. 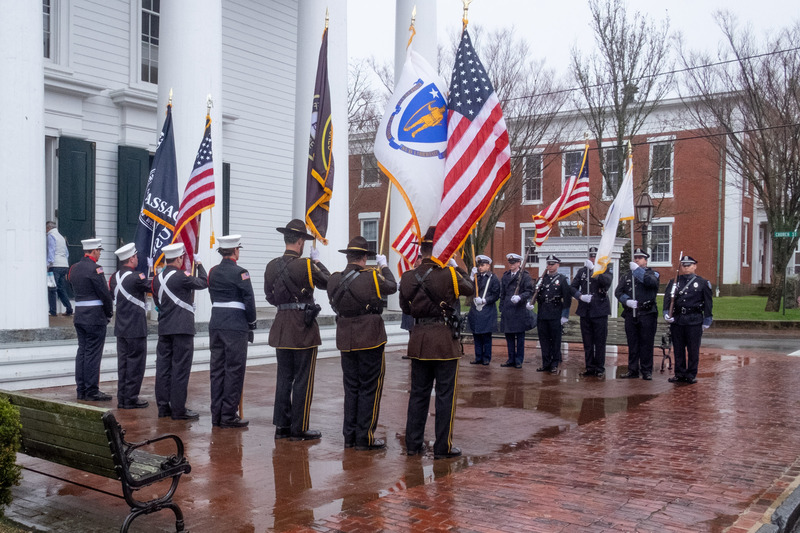 Family, friends and hundreds of Edgartown’s finest gathered at the Old Whaling Church on Monday to honor the life of native son, senior statesman and war hero Ted Morgan. Born and raised in Edgartown, Mr. Morgan enlisted in the Army at 19 and shipped off to Europe shortly thereafter, where he completed 25 plane jumps and endured a month of heavy combat during the D-Day invasion of Normandy. Although he retired from the army as a Lt. Colonel, Mr. Morgan returned to the Island and continued his service as an Edgartown selectmen for 30 years. In a moving ceremony on Monday, those whose lives Mr. Morgan had touched honored his near-century of service to his family, town and country with heartfelt words of remembrance. Wreaths and carnations lined the stage of the Whaling Church, with Mr. Morgan’s coffin front and center, draped in an American flag. Stories about Mr. Morgan brought tears and laughter to all in attendance. “Win or lose, Ted had our backs,” Mr. Rappaport said. There were other refrains less familiar to Mr. Morgan, Mr. Rappaport recalled. “Those included patience and the open meeting law,” he said, drawing chuckles. Former longtime town administrator Peter Bettencourt remembered Mr. Morgan falling out of his famous swivel chair at a selectmen’s meeting one week. When he reappeared from beneath the table, Mr. Morgan acted like nothing had happened. Mr. Shemeth described how on a cold winter night two years ago, a 95-year-old Ted Morgan stopped his Buick to get out and shake the hand of every member of the Edgartown fire department. Others talked about how Mr. Morgan made himself available at all times, even once responding to a 3 a.m. noise complaint about noisy ice machines at the former Shiretown Inn. Mr. Bettencourt said Mr. Morgan went downtown in the middle of the night and unplugged the machines. Selectman Michael Donaroma, who was raised by a single mother, described Ted as a father figure. Mr. Morgan’s own children described growing up with a father who they could call their hero; a man who would throw golf clubs farther than his shot, a man who believed that learning the lesson was just as important as the lesson itself. One of Mr. Morgan’s sons finished his own military career as a colonel. A true Patriot and a great send off. I'm so sorry to have missed Ted's send off !! He was alway there for my Mom Queenie when she worked in the Selectman's office and was there for her until the very end of her life. Thank you Ted ! Patriots Day was fitting indeed. Godspeed ! !